Just a quick post, since this turns out to be a week with way less time for sewing or blogging than I expected. I finished this top literally minutes ago, which explains the not-so-great picture: I didn't keep trying until I had a decent one. The fabric is a very thin, and ever-so-slightly sheer olive/brown cotton jersey from my stash. I pattern is one drafted last winter, made up in orange knit and blogged about here. Although I love the look of the first top, the fabric is just a bit too synthetic for my liking. This new one may be less striking but it will go well with my planned colours for autumn/winter. I have another fabric in my stash which would work well with this design (and I'm thinking of using it within the next two weeks). If you're interested, I'll do a how-to for it (pattern and sewing) then. First of all, I would like to thank everyone who commented on my earlier post about the 'button-rule'. I've learnt some interesting things because of your efforts. For those of you who haven't read their comments, I'll summerize the main points here. - Thanks to Dora and Vibeke, it is clear that there is indeed a (Old Testament) rule in the Bible, forbidding women to wear men's clothes. As I understand it, it is part of a body of rules covering all aspects of life. Many of these were never obeyed by christians in Europe and some, like this particular one, have been interpreted differently at different points in time. There might be a semi-religious ground for the 'button-rule' but I haven't found any evidence to support that theory. 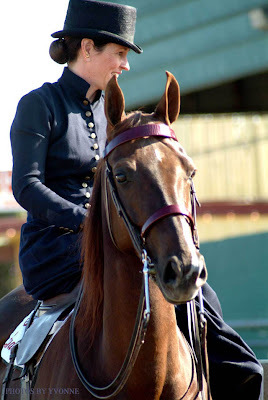 - It was Tanitisis who found more information about the theory that women's closures were meant to prevent indecent exposure when riding (or preparing to ride) side-saddle. Apperently, most ladies ride with their legs to the horse's left. I did a quick search myself, and she's absolutely right. However, I don't agree with her conclusion that this would make the buttons gape most visibly. As this image shows, the opening between the buttons would point to the back of the horse when sitting straight. I guess the stable boy would hold the head of the horse when the lady was getting on it, so this set-up might actually help to preserve her modesty. Lastly, I can't believe I didn't check Wikipedia on button information before. There wasn't much on the rules for button closures. There was only a short reference to it, in the entry about buttonholes. However, one very important bit of information was added here: according to the person writing this, the maids dressing the ladies, and indeed all common women, would wear shirts which had the same kind of closure as men's shirts. Unfortunately, there's no picture, no specific example is given and there are no dates at all. If this claim is true, it would be a strong point in favour of the 'ladies being dressed' theory. After all, it is very likely that this feature of ladies' dress would become a bit of a status symbol, which was copied by other women even though it didn't serve a purpose for them. 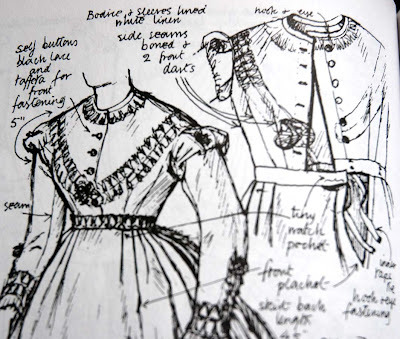 Once adopted by a large percentage of the female population (say, in the Victorian era), it would have become a standard for the growing RTW industry. I also learned a bit more about buttons and button closures in general. Apperently, the oldest buttons ever found are between 4000 and 5000 years old, made of sea shell and excavated in the Indus valley. There are also examples from Bronze age China and Ancient Rome. In all these early cases, a button was used as an ornament, not as fastening, it was like a sew-on broche. The earliest functional buttonclosures are from 13th century Germany. 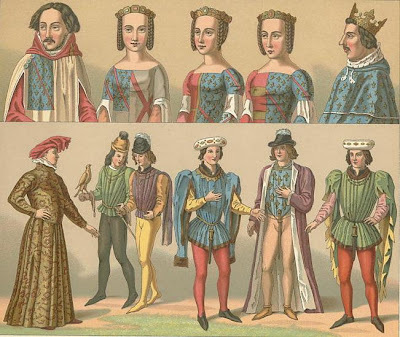 They became a common feature on the close-fitting garments fashionable in 13th and 14th century Europe. Well, there was a reason for that. I was sewing an autumn/winter coat for E.
He wanted a coat which would be casual enough for everyday use but could be worn with his only suit without looking out of place as well. His career changes of the past year have forced him to brush up his wardrobe a little bit, but he did not yet have a coat to match. Getting the fit of the basic block right took me a lot of time. In women's wear, you can draft almost every top from the basic, fitted sloper. As long as you remember to add ease for certain garments and styles, of course. For men, there's no such thing as an all-purpose top sloper. Every piece of traditional men's attire, shirt, jacket, vest and coat in formal and casual shapes, has its own basic draft with added ease inherent to the style. You have to know these pretty well in order to make educated guesses about which one to use for a slightly less classic design. 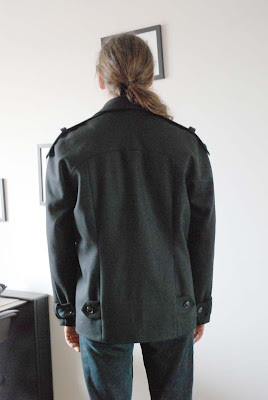 I had tried to make him a coat last winter, based on a block draft for a formal jacket. Which utterly failed. 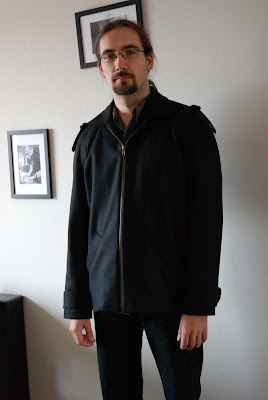 I threw away last year's drafts and made a fresh start using a block for a casual jacket from one of my pattern making books. Drafted based on E's measurements of course. As it turned out, that block included a lot of ease in the body, which I had to take in, and not quite enough in the sleeves. Maybe E's built is just more athletic than the average. The fabric is a densely woven, but not very thick, black wool coating which had been in my stash for over a year. It was very nice to work with and I still have about 2 meters left... I used a zipper which I bought last year, for my first attempt at a coat for E and black lining and fusible interfacing from stash. I promised you a post with this subject, so I'll give it a go. I really don't think I can cover all the different aspects of this sticky topic in one post, but I may have a little bit of extra insight. But, more about that later. These are just two examples of sizing tables. The pink one is Burda's, the grey one comes from Knipmode (where "bovenwijdte" = "bust measurement", "taillewijdte" = "waist measurement" and "heupwijdte" = "hip measurement"). You may have wondered about those ever-wrong sizes. Why are you a size 34 in one store and a 38 in the other? Why do you often have to pick a larger size than your usual RTW one when studying the sizing tables of sewing patterns? Isn't there some kind of standard? Well... That's the point, isn't it? There is no standard. There is no rule telling fashion brands or pattern makers that such-and-such are the measurements for each size. As a 'rule', fashion companies (for RTW and sewing patterns) try to size their products according to their customer's expectations. That's the reason sizes run (much) smaller at youth-oriented stores like H&M. Not just the number stuck on the main size (bust circumference for dresses and tops, hip circumference for bottoms) differs, but also the ratio between measurements. Again, this is based on the target customer. A company which only sells in the Netherlands, or northern Europe (like sewing magazine Knipmode) will make its designs for rather tall women (Dutch women are tall, on average). And a company selling mainly to 35+ women will decide on a much curvier basic block than one selling to ages 15 to 25. In RTW, you would do well to seek out and remember the brands which best fit your body shape. You probably knew most of that already. However, there's another nastly little secret which will sound familiar to the experienced seamstress. Fashion companies have to start somewhere when making a new design. In theory, this starting point is an ideally shaped specimen of the body type of their target audience, in their most average size. However, many brands have to present clothes to retailers to sell them and for that reason, they may prefer to go with a smaller than average size which looks better on a hanger. 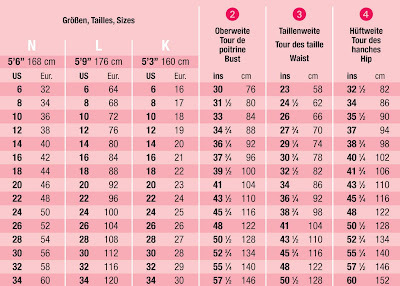 In the Netherlands, the size most brands do their fitting for is 38. Their own 38. Usually combined with a height of 1,70 meter and a B cup. That's why I said seamstresses would recognise this. This is what all the talk of full bust and small bust adjustments is all about. It's why they're needed. And why anyone with a seriously different cup size has such trouble buying clothes ready-to-wear. Another major cause of confusion is what is known as 'size inflation'. Apperently women are more eager to buy if they are pleasantly surprised by the size on the tag. To use this effect even while people are generally getting larger, companies regurlarly adept their sizing tables. Those selling sewing patterns do this rarely. They know their customers are used to go by the sizing table and will only change it if they feel there is a real, over-all change they have to respond to. For example, about two years ago, Knipmode changed its sizing. They made each size slightly bigger but, more importantly, they changed the standard height from 1,68 to 1,72. To suit the afore mentioned tall Dutch woman. In doing so, they lost me as customer because my measurements had now pretty much dropped off the chart. Ready-to-wear manufactures live by their ability to respond quickly to the market they're in. They employ people who constantly monitor the application of their blocks and adept the size and fit of those blocks to customer demand. So they may change quickly and often. Well, here's creation number two in my colour coordinated plan for autumn/winter dressing... And I'm not entirely sure about it. I bought the fabric because I've started to like turquoise more and more this past year (see my 50's dress, for example). It would also provide a fun, fresh note among all those warm, rich jewel tones. And was part of that Marni colour palet I liked so much. And the stripes... Well, I couldn't just use plain fabrics, could I? I've never worn a lot of obvious stripes, but sometimes they apeal to me for their fresh, clean look. It started out as a basic t-shirt shape with an impressive, 1930's style sleeve shape. I played with this shape before, but, back then, I kept the points higher and closer to the arm and added gathers. This time around, it's the full cowl-sleeve as described here. I should have realised the risk of using horizontal stripes with a very broad shoulder. At first fitting, with a high neckline this top looked very bad indeed. My boyfriend, usually a good judge of whether or not a certain look suits me, kept asking whether or not this was the 'real' fabric. Fortunately, I realised that opening up the neckline improved it considerably. I sort of like it now, although it will take me a while to get used to it. I usually don't wear broad shouldered things or this colour and stripes. How well it's going to work with the rest of my planned autumn clothes remains to be seen. I'm wearing it here with my charcoal grey flared trousers. Do you remember my statement of intent regarding colours for this autumn/winter? Well, even though I've been a bit slow at sewing this past week, my mind has been working overtime. I want to create a sort of capsule-wardrobe from these fabrics. With pieces which can work together or with other thing which I already have (which are mostly black and grey, so that shouldn't be too hard). 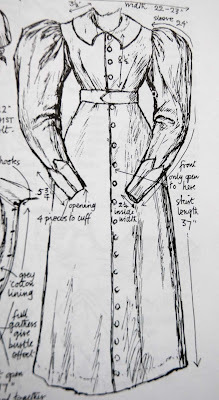 So far, I've dreamt up two trouser suits, two cardigans, two sleeveless woven tops, one or two sleeveless or short-sleeved knit tops, one or two skirts, two long-sleeved tops (although I would have to buy fabric for one of those) and a refashioned jumper. And that's just with the fabrics which fit in the colour palet. This is the first piece to make it into reality. I bought this fabric at the market when it crazily cheap on sale (50 cents a meter). My reasoning was that if it turned out to be nasty, I could at least use it to make muslins. But it's something like cotton fannel (I did a burn test, it's definately a plant fibre) and ridiculously soft. I'm just a bit concerned about its durability. In my opinion, cheap fabric is ideal for experiments. I like the vintage style trousers with side closures which I see on other blogs. However, I haven't worn any trousers without a front fly for at least 12 years. And I was considering buttons for this one as well. To make a long story short, I drafted these from my trouser block. They're quite simple: wide straight legs, a straight waistband at the natural waist and buttons at the left side. I'm happy. They fit just like I wanted them too, don't gape between the buttons and are very comfortable. I'm wearing them here with silk shirt nr. 2, which I didn't alter. 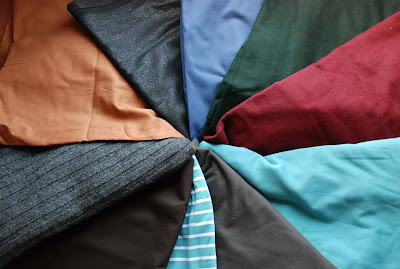 I just remembered something quite ironic: one of my very first serious attempts at making clothes (when I was about 14 years of age) was a pair of trousers in a very similar colour. It was in the early 90's and the pattern came from Knipmode: waist-high, tight and tapered trousers (probably meant to be a bit like leggings) with a side (!) zipper and zippers at the ankles. I made them in polyesther gabardine with brass zippers. With a matching tunic. I've only worn them a few times. The fit wasn't right and the side zipper was unfaced and its teeth bit in my hip at every twist and turn. It seems my sewing has almost come full-circle. Now with more knowledge and skill. I hardly ever shop or use normal patterns, so I tend to forget about this particular issue. However, I do sometimes buy second hand/vintage clothes. I usually don't look at the size on the label. I concentrate instead on material and shape/style or refashion potential. In my previous post I, and some of you, already mentioned how different fashion eras champion different shapes and ideas of fit. This is an issue you definately come across when shopping second hand. 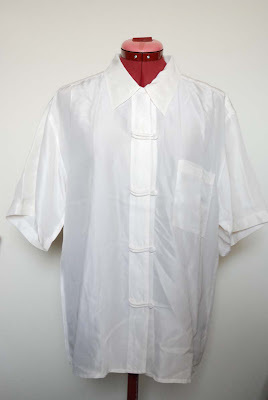 I bought this silk ladies' shirt for 1 euro several weeks ago. According to it's own size tag, it's a size S and it was made in China. I think, based on the style and that rather generous size (it's on my old dummy here, which is larger in the bust than I am. I still have to find some legs for Mary) that this is an 1980's garment. I like the Chinese knot detail of the closure and thought I might try to wear it as is. But I haven't yet. Even belted, it just feels too bulky. 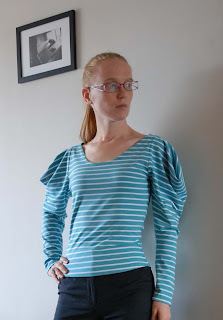 I'm thinking of re-setting the sleeve to narrow the shoulder but it might need yet more work. It's lovely smooth, light and soft silk, so it would be worth the effort. This shirt is also silk and I bought it today at the same market stall. This material is less finely woven, resulting in a shirt which feels smooth and has a cotton-like hand. According to it's size tag, this shirt is a size 40 and made in "W.-Germany". I'm not sure how to date it. The fact that it was made in West-Germany means it has to be pre-1990, of that I am sure. 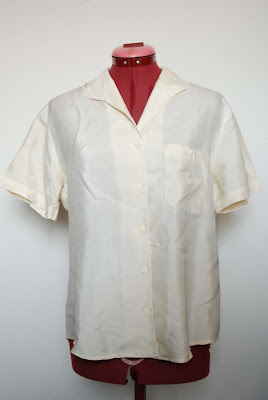 Although it's undarted, it seems too closely fitted for an 80's shirt. On the inside, both shirts are finished with the same 3-thread serging. The style of the collar doesn't look recent. German sizes are the same as Dutch size and if this shirt was in a shop today, it might make quite a few women comment on the evils of sizing. It's a bit wide on me, but fits about right at the shoulder. Usually, a size 36 will fit me at the shoulder. I should really do a proper post about RTW sizing, size-inflation etc., some day soon. But I have to think on that a bit longer... For now, I'm just curious about your ideas about the dates on my shirts, your tales of strange sizing and, if you feel particularly helpful, any tips on what to do with shirt number 1. 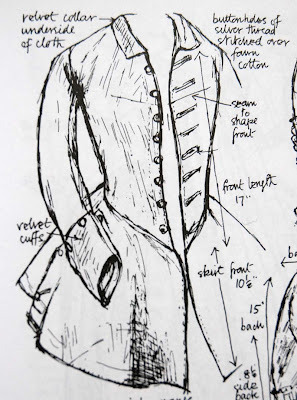 On some blogs I read, there has been discussion recently on subject of tailoring. Mostly coming to the conclusion that you can only really ever hope to make a proper jacket by buying expensive fabric and putting in hours and hours of fastidious manual labour, padstitching layers upon layers of different kinds of heavy interfacing. Hm, I have to admit, this was one of the issues which made me feel like I was underachieving... And I would like to try out this form of hard-core, couture-style tailoring somewhere in the (possibly quite near) future. However, sewing is not an exact science and, in its history there has hardly been a golden rule which couldn't be broken. In ready-to-wear, the kind of tailoring I refered to was practised on a large scale up to (about) the 1950's. 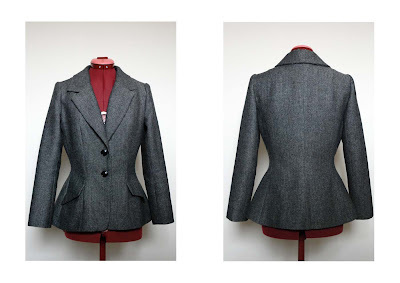 Good tailored jackets would be able to stand to attention on their own. In the late 1960's and 70's, the youth culture and the decrease in formal dress codes allowed for an emphasis on comfort. Classic suits (for women) were no longer a fashion item. The power suit of the 1980's was a different beast. Heavily padded in the shoulders but a lot less fitted than its predecessors. It actually relied on flowing fabric for its appeal. So no more all-over interfacing... And, of course, many 50's suits were tailor made. Almost all 80's suits were factory products. Now, I don't claim to know everything about sewing or fashion history. The story above was just intended as a general overview. I do not, for example, know when fusible interfacings were first introduced. Either in RTW or for the home seamstress. I do know, however, that nowadays fusible interfacings are available in a huge range of weights and styles (I actually have a bit of fusible horsehair canvas in my interfacing stash, for example). Finding the right one for your fabric and project and applying it properly will go a long way to help you make a professional looking garment. Case in point? Well, doesn't the jacket in the picture look classic? And, if I dare say so myself, well-made? I made it about one and a half year ago. I drafted the pattern myself and used a fairly solidly woven, mid-weight herringbone tweed, interfaced throughout with woven interfacing for wool fabrics. That stuff sticks to the fabric very well and, rather than adding a lot of weight, it acts like a thin web, slightly stiffening but mostly stabilizing the fabric and allowing you to shape it. I'm posting it here as a reminder, also to myself. I won't make any assumptions about menswear, because I lack experience in that area. 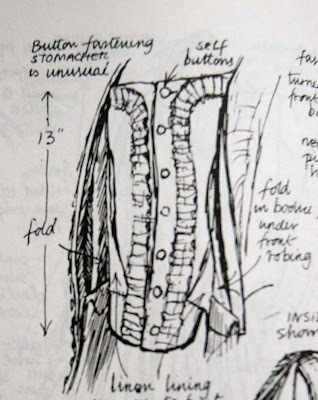 However, when making a ladies' jacket, consider ALL your options. Fusibles are not evil. A few years ago, I spent three months in Edinburgh as an exchange student. I loved it there but unfortunately, I still haven't had a chance to go back and see more of Scotland. Although Edinburgh is home to the most amazing vintage store I've ever visited (at the foot of Castle Hill, about three stories of an old building stuffed from top to bottom with anything from genuine antique garments to very affordable 'normal' second hand clothes) and tartan and kilts are sold everywhere (varying wildly in both heritage and quality), I did not buy this skirt there. I found it last week at my usual vintage stall at The Hague's Monday market. It's 100% wool, from a Scottish wool mill and pleated the way these ladies' skirt usually are (real kilts, which are menswear, are much wider, up to 6 m, and the 'set' of the plaid is repeated in the pleating). It was also a size medium, and therefore a bit too big for me. But 'too big' can be fixed. At home, on closer inspection, I found three small moth holes at the back of the skirt. I asked M for advice and ended up hiding two of the holes in the folds (stitching around them and then pressing the fold back to how it should be) and 'darning' the last one using water, steam and a needle. Sort of like needle-felting-light. I also moved the inside closure and added an extra hole to the buckle strap. It's by far the laziest way to make it smaller, but I think it just works out. I thought about making it shorter as well, but as you can see, I didn't. I kind of like this look, and I'm reading everywhere how longer skirts are about to make their big come-back so let's find out how this works in the real world. I can alway do more to it later. Based on what I read on other blogs, my style of fabric shopping may be somewhat a-typical. This is owed mostly to how I find most of my fabrics: stalking the sales of the local fabric stores and mostly, the stalls of the The Hague market. Especially the market is a source of cheap fabric. Most of it is polyesther nastiness, with some OK cottons thrown in for good measure. However, over time, I have perfected the art of finding the one bolt of nice wool blend, all cotton jersey or whatever else in natural fibres, on the entire stall. Although I don't buy anything I really wouldn't wear, this strategy means I often buy out of season and Isometimes end up with a lot of similar colours (like olive coloured jersey: I've got lots of it, all cotton, but in three different weights and unfortunately the colours don't match exactly). I have also, in this past year, realised I have to buy more colour. Which can be a bit hit-and-miss. These are all fabrics from my stash (although, to be fair, most of them, and certainly most of the striking ones, were bought within the last 6 months), which will fit in with my new colour plan for autumn winter. The colours in the picture are not exactly right, but close enough. Crucially, only the sparkly stuff (cotton voile. I'm not usually a sparkle-loving person, but I think it could be a nice accent as a sleeveless blouse worn with these rich colours) at upper left is black. The fabric in the lower left corner between the grey rib knit and the breton stripe is brown. I thought I really, really had to find some ocher or mustard yellow for the colour scheme I wanted, but the beige-ish cotton voile gets remarkably close (and is the only fabric here which I bought thinking it wouldn't work on me but I would use it for my mother or sister. Who, by the way, are never very enthousiastic about having me sew for them. I think they're afraid I'll be overbearing style-wise. Which I wouldn't be. Or only if I'm right ;D ). Of course there will be other fabrics too. Black wools, that eye-popping purple, tweeds and some black-and-white checks come to mind. And isn't it interesting that in my stash, apperently, prints are for summer and rich colours for winter? However, I'm quite pleased with this line-up and I'm already mentally mixing and matching the yet-to-be-made garments. I've never colour plans before, but right now, I'm feeling inspired by them. Do you have any experience with that? Or other good planning tips?